Thank you for your kind comments about Molly. I added your link to the post. One of my blogger friends, Erica (see above), just lost her classroom pet of over 9 years- a Guinea Pig named Molly. Be sure to take a moment to read her inspiring post about what a wonderful classroom addition she was and leave a message for Erica. Thanks for joining in on my giveaway!! Hi Karen! 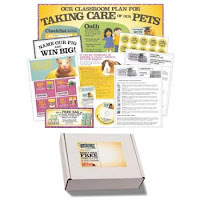 I work with Pets in the Classroom and want to thank you so much for posting this information on the grant program! We appreciate your help in getting the word out to other teachers on both the grant program as well as the advantages of having a classroom pet. I hope you don't mind, but I reposted your post on our blog: http://www.petsintheclassroom.org/2011/08/pets-in-the-classroom-from-a-teachers-perspective/. Thanks again! Thanks for the letter home to parents. I actually just applied for the classroom grant this week and I'm hoping to receive it. I'm going to go sign up for the teaching kit now. Do you send your classroom pets home every weekend or only over extended weekends? Rachelv- Thank you so much! I'm flattered that you liked my post enough to repost on your blog! Thank you so much for everything you and the Pets in the Classroom program do! EFranklin- I only send my pets home over extended weekends and holidays- unless I have more volunteers to bring them home than we have long weekends. I like to make sure that everyone who signs up gets a chance to be a "pet sitter" at some point throughout the year. Thanks! That's what I was planning on doing, too! I have another question- do you know the name of the font that you used for the top of the permission slip? I love it! Thanks for the letter to parents and permission slip! It is exactly what I was looking for. I also applied for the grant! Great information!